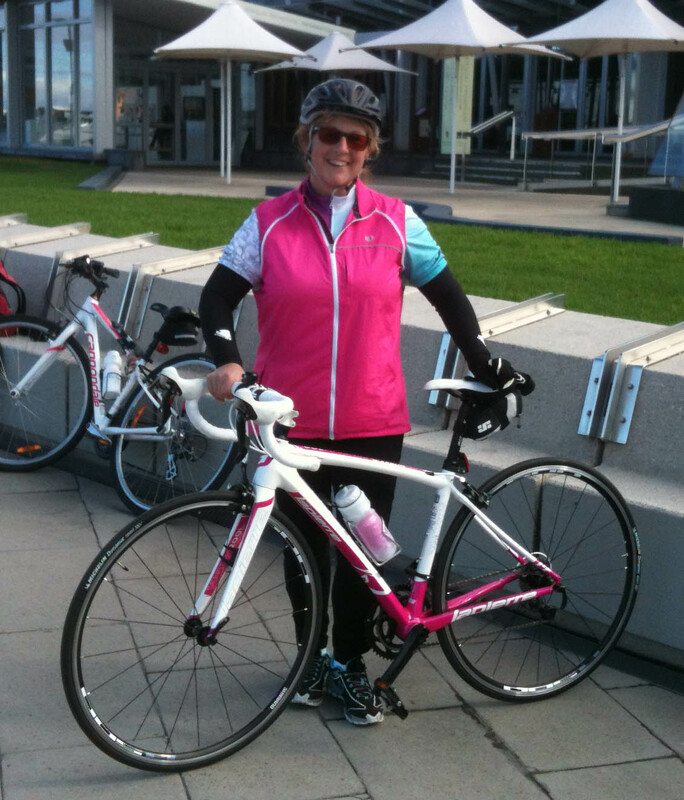 Tina McCarthy is changing women’s lives by getting as many of them riding bikes confidently. She has a Melbourne-based business called Wheel Women and focuses on social and recreational female cyclists. Tina contacted me a while back and we’ve kept in touch. I’m very impressed with her enthusiasm and passion. Women Who Cycle asked her a few questions about her business – Wheel Women. Q: When and Why did you start cycling? A: I’ve always cycled, for as long as I can remember. I had 3 older brothers so I didn’t have any choice if I wanted to keep up with them. But as an adult life and career kind of got in the way. When my son was born in 1998 I did start cycling a little bit again when he was in the baby seat, and then on the tag-along. But I found it increasingly difficult – the bigger he got the harder it was. But about 3 years ago, my son who is now a teenager was training for the Great Victorian Bike Ride, and I stupidly thought I could join them on a training ride. I wondered why everyone was passing me and I was left for dead! Short answer is, my husband suggested a new bike instead of my department store special at 22kg! I bought an eBay bike and couldn’t believe the difference – it was AWESOME. I’ve now become a little more serious about my rides and ascribe to the N+1 theory of bike ownership – you can never have too many bikes! Though my husband does like to dispute this! Q: Tell us about your business Wheel Women. What is your overall vision for the business? When and how did it start? A: Wheel Women started back in November of 2012, but I’d been working on the idea since about July of that year. I’d always wanted to ride with other women but I wasn’t a club kind of rider and I didn’t want competition. The local bike shop guys told me that if I wanted a ride group I would have to create it myself. So I did! Wheel Women is really about getting women on their bikes in a social, recreational and non-competitive environment. We have a policy of ‘no lycra necessary’, but very often we find that as riders advance and become more educated about riding, they end up wearing a little bit of lycra anyway. We have loads of FUN and we never take ourselves too seriously. We like to think we break down a lot of the barriers to what women face when they think about cycling and I think we are really having an impact. What is my vision – I’d like to think we will be the leaders in establishing change in getting women on their bikes. We do things a little differently and it seems our riders really appreciate that. Certainly their comments reflect this and I know we are really making a difference. I’d like to see Wheel Women in every state with rides and programs happening everywhere, but ultimately, I want to see mass rides for women and their supporters happening all over the place, be it local or state or even national. How awesome would that be! Cycling really does change lives and women on their bikes is a beautiful thing! Q: What’s a typical working week look like for you? Sun – my day with the family, and yes, I usually ride with my husband and son. This week was a little different though because I worked in the garden instead! Monday – writing and completing a grant submission and then some retail therapy of the bike kind! I find it relaxing to go and just look at bike shops – weird, I know! Then ride in the afternoon. Tuesday – I had to set a route for a group of teenagers I ride with and that I’m training with for the Great Vic Bike Ride. The one thing the kids miss out on is hills training and we needed something that was easy for them all to get to. I went scouting today and found an up and down for 22km, short and sharp and where there is always a headwind on the route. Wed – I’ll be attending to business ‘paperwork’ and doing jersey orders and also picking up a new bike I’ve been asked to review. Thursday – a typical 2 hour Wheel Women session in the local community. It’s a beginner group and we have some great ladies starting their journey (and we finish with coffee and chat), then in the afternoon I’ll be attending to some bike cleans after all the wet weather. Saturday – training ride with my teenagers group to attack the hills. All up we’ll do about 50km and incorporate a skills session as well – they need some traffic riding skills so we’ll do roundabouts as well as bunch riding techniques. Q: What’s the most satisfying part of your work with Wheel Women? A: The most satisfying part of what I do is seeing how much it makes a difference. Just tonight I received an email from someone who told me her rides are sanity moment in what is a tough personal time for her. But that isn’t unusual, I get text messages all the time from riders telling me they just reached a goal, or completed a milestone and it makes me feel so great that they want to share that with me. I love seeing other women feel good about themselves and feeling happy and healthy. Best text message ever – “what a difference you have made to our lives!” How good does that feel reading that? Q: What are the major obstacles preventing women from riding bikes? How do you think we can overcome them? A: Gosh, where do we start? There are lots of obstacles and I think as women we are actually good at creating our own obstacles. They really aren’t obstacles but we put them in the mix so we don’t have to do the hard yards, or to give us an excuse as to why we don’t do something. The reality is that there really aren’t obstacles to cycling – it is as simple as getting on your bike and riding. Sure, the traffic is a barrier for many, but with some help and guidance it isn’t that scary. What we need is to provide better access to accredited education programs about cycling, such as the AustCycle ones. If women could access these, then they are on the path to breaking down their perceived barriers and getting on their bikes and achieving what some of our riders have done. If women find it hard to access programs, I think finding a buddy to ride with is the best – it really doesn’t have to be anyone who already cycles as they can sometimes be intimidating. Just find a friend to share the journey with! Q: What are your plans for the future for Wheel Women? A: For the future, we plan to have many more locations running Wheel Women and providing access to programs for women. The long term goal is to see as many ‘bums on saddles’ of the female variety as we can. If we can get women riding, then we know that they are great role modellers, so it makes a difference across the board in the community. Cycling has so many benefits to physical, mental and environmental health and we hope that we will be seen as a big contributor to all of these areas. I’m also planning on some overseas study so I can look at a few of the ideas that are developing particularly in the US. They are really leading in a lot of areas with cycling for women at the moment, but I’d like to see us in Australia taking the lead. I’ve just been appointed to the Board of the Women’s and Girls Commission at Cycling Victoria and I think volunteering for roles like this will also help have an impact.